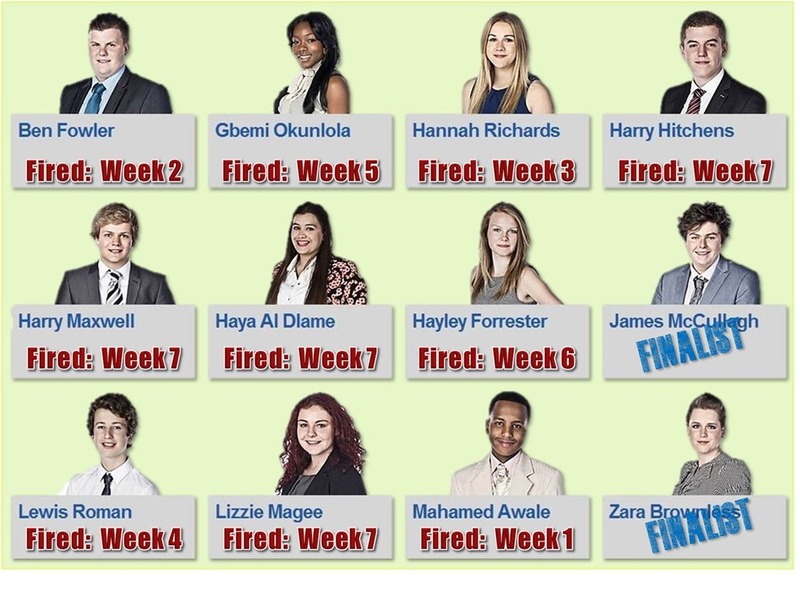 Last nightï¿½s Young Apprentice was truly exciting. As usual, we saw plenty of examples of poor, good and superb performance, but my overall assessment matches Lord Sugarï¿½s: the six young people competing were all extraordinary examples of the talent that their generation can field.ï¿½ I am afraid i will have to get just a little socio-political by the time I get to the end of this weekï¿½s assessment. Last nightï¿½s high-stakes game was for two teams to develop a brand concept for flavoured popcorn, and two flavours, to pitch to three buying teams in three industries that buy snack-food items: an airline, a supermarket, and a cinema chain.ï¿½ Lord Sugar picked the teams and set the rules: the losing team would all be fired and one candidate from the winning team would also be fired.ï¿½ Now the emphasis would all be on team-work. Not Harry Mï¿½s fortï¿½. With predictable dynamics, every member of each team pitched for the Project Manager role and in each, the least assertiveï¿½ (Lizzie and Haya) backed down and got to choose PM. It was a pretty poor brand. Atomic could not cohere.ï¿½ Harry H and Lizzie went for an American theme, while Harry M held out (and held out, and held out, andï¿½) for ï¿½Smoochiesï¿½ ï¿½ a sharing popcorn.ï¿½ Lord Sugar seemed to like Harry Mï¿½s idea, but I was with Lizzie: it seemed immature and naff.ï¿½ I did like the ï¿½Empire Stateï¿½ brand they eventually choseï¿½ albeit, I donï¿½t think Harry M really ever got behind it. The teams had different strategies.ï¿½ For Kinetic, Zara pitched all three times and did it very well. ï¿½Breathtakingly goodï¿½ was how Nick Hewer described her.ï¿½ She did, however reach astonishingly great heights of hyperbole and also told a budget airline that they offered ï¿½the highest standard, which Iï¿½m sure youï¿½re looking for.ï¿½ Itï¿½s a budget airline: not killing people is the standard they are looking for if the ones Iï¿½ve flown with are anything to go by.ï¿½ She also rather comically described the ï¿½laï¿½ as ï¿½the prefix tells the consumer the product is a little bit from abroadï¿½.ï¿½ Actually it tells us that the branding was done by Brits with no faculty for languages.ï¿½ But I quibble.ï¿½ Zara is, as I have said, a great performer. So is Harry H, which made it disappointing that his pitch to the cinema chain (Odeon) was decent, but no better.ï¿½ Both Harrys gave good answers to tough questions, but the buyers seemed underwhelmed. But Harryï¿½s strategy was different from Jamesï¿½.ï¿½ He allowed each candidate in his team to pitch and this is where Lizzie shone.ï¿½ I thought her pitch the best of all we saw.ï¿½ I really got the impression i was wrong last week to suggest Lord Sugar should have fired her rather than Hayley.ï¿½ She emerged as a very strong candidate last night.ï¿½ Harry Mï¿½s pitch was the weakest we saw, to the supermarket chain, Morrisons. Interestingly, at the outset Lord Sugar had not stated the rules for who would win ï¿½ allowing, I think, for him to select a winner if the ï¿½who sells mostï¿½ rule gave the wrong answer.ï¿½ But I also noted that he had split my two strongest contenders, Harry H and Zara.ï¿½ This meant that only one would get an automatic firing.ï¿½ In the end, he went with the simple rule.ï¿½ And here is the results the teams got. Kinetic won ï¿½ despite the airline hating the taste of their product, because the hundred pound gorilla drove the result.ï¿½ And the hundred pound gorilla that is one of the big four UK supermarkets defines Harry Hï¿½s fatal flaw. Harry H commendably took the first pitch and generously shared out the opportunities for glory.ï¿½ James said he didnï¿½t care about fair: he wanted to win.ï¿½ Zara was the best person to pitch.ï¿½ He asked her to do all three.ï¿½ Harry H is, on what we have seen over the earlier six episodes, by far the strongest pitcher of the Atomic line-up.ï¿½ Morrisons were going to be the most important pitch.ï¿½ï¿½ Harry M had reservations about the brand.ï¿½ That was Harry Hï¿½s fatal flaw. Throughout the episode, Atomic looked best, due to Harry Hï¿½s and Lizzieï¿½s strengths and Jamesï¿½ bull-in-a-popcorn shop ï¿½I donï¿½t agreeï¿½ style. I thought Atomic had the stronger brand and the more easily saleable flavours.ï¿½ I must however concede that Morrisons buyers can probably see through the strengths and weaknesses of a pitch to the saleability of a product.ï¿½ Maybe ï¿½la Popcornï¿½ would be more saleable than ï¿½Empire State popcornï¿½. I pretty much agree with Lord Sugarï¿½s sentiments about the members of the losing team. Lord Sugar clearly found much to admire, despite Harryï¿½s obvious shortcomings.ï¿½ He has often been right, but has not found a way to win over people. Iï¿½ll say plainly: she impressed me this week and I under-estimated her last week.ï¿½ Lord Sugar described her as straightforward, straight-speaking and honest. Lord Sugar described Harry as giving a ï¿½general all round great performanceï¿½, saying he was ï¿½sorry weï¿½re parting in this wayï¿½.ï¿½ Clearly he shared my view that Harry was an extremely strong candidate.ï¿½ For my money, on what we have seen, I still think he was the strongest. Who would go, out of Haya, James and Zara.? She really had learned to listen through the process and had, as Lord Sugar acknowledged, taken on his advice.ï¿½ She is determined, but not innovative. tracks back to one great pitch near the start of the show.ï¿½ She may be a safe bet to not foul up, but she does not astonish. James has made the longest journey.ï¿½ His rough edges that were so grating in early episodes have smoothed considerably.ï¿½ He does not impress as a ï¿½professional presenceï¿½ as Harry H does, but he is certainly the most commercially-minded of the candidates.ï¿½ I always suspected that this would endear him to Lord Sugar. Zara is eloquent in the boardroom and out, and like Harry H looks the professional already.ï¿½ Lord Sugar worries whether she will want to get her hands dirty, but i read her as a powerful shaping force who will lead from the front when she needs to. I agonised over who I thought Lord Sugar should fire out of James and Hay, but as soon as he fired Haya, I knew he was right.ï¿½ My vacillation came down to an early dislike of James, clouding my judgement ï¿½ the ad hominem trap.ï¿½ The ad hominem trap is a logical flaw in reasoning, where personal characteristics blind us to evidence. Sorry James.ï¿½ You were hard to take early on, but the effort you have made to change over the series impresses me.ï¿½ Lord Sugar asked about you: ï¿½can the leopard change its spots?ï¿½ï¿½ I saw far fewer spots last night than in episodes one and two.ï¿½ Yes, I think it can: I think it is changing them. If you donï¿½t like politics, turn away now!ï¿½ I wonï¿½t do this often. At the end of the episode, we heard Lord Sugar, Nick and Karren discussing how impressed they are with the young people on the show.ï¿½ Hear hear.ï¿½ They are exemplars to their generation.ï¿½ But here is the thing: every single one of them is doing well at school.ï¿½ Some may not be stellar academics, but I was captivated by Phillip Zimbardoï¿½s analysis that success is not attributable to race, culture, wealthï¿½ï¿½ The one thing it really does correlate with is a forward focus ï¿½ a sense that the future is the most essential time frame.ï¿½ And one thing that systemically creates that mental attitude is educational opportunity.ï¿½ Some parents do: some donï¿½t.ï¿½ Some cultures do: some donï¿½t.ï¿½ But education does. Many entrepreneurs (like Lord Sugar) left the education system early.ï¿½ They succeeded for their own reasons.ï¿½ But education really is the magic key.ï¿½ So why in the name of all that is precious would we make cuts to Sure Start? Why would we treat teachers like anything other than the heroes most of them are?ï¿½ Why would we make young people face years of debt (which our Government tells us is a bad thing) just to get the education that they and our country need to create the workforce of the future?ï¿½ Why do we have an educational policy that values traditional subjects (like those favoured by public schools) over real life skills (like those the young people showed here) and equally valuable vocational skills like engineering and other trades (I say this having thrived on traditional subjects)?ï¿½ Why on earth is MP (Member of Parliament) a more prestigious tag thanï¿½ RN (Registered Nurse) or PGCE (Post Graduate Certificate of Education)?